Taylor Morrison's Bonterra at Cross Creek Ranch is a new 55+ community located in Fulshear, Texas. This age-restricted neighborhood features a variety of elegant single-family home designs that are perfect for empty nesters. Residents of Bonterra at Cross Creek Ranch will also enjoy private resort-style amenities on top of all that the master-planned Cross Creek Ranch community has to offer, which includes a beautiful clubhouse and access to the Weston Lakes Country Club. This active adult community also boasts an incredible location just 30 miles from Houston for big-city entertainment and attractions, while offering residents a quiet and private community setting to call home in Fulshear, TX. The biggest draw of this 55+ community is the rich lineup of proposed amenities for active adults. Currently in the planning stages, Bonterra will offer a 10,000 square-foot clubhouse for the exclusive use of the age-restricted section of the community. It will have a fitness center, aerobics and dance studio, and locker rooms for residents' convenience. There will also be several social areas that include a grand event space, ballroom, arts and crafts studio, card room, and game room. Bonterra at Cross Creek Ranch is also unique in that it will offer a massage room and a continuing education center, which are typically not found in active adult communities. Outdoors, residents will have several options to make the most out of the beautiful Coastal Texas climate. There will be an outdoor pool, patio, and kitchen. Competitive neighbors can play a game on the pickleball or bocce ball courts. There will also be an event lawn, walking and biking trails, a fire pit, and scenic ponds. The amenities don't end there. 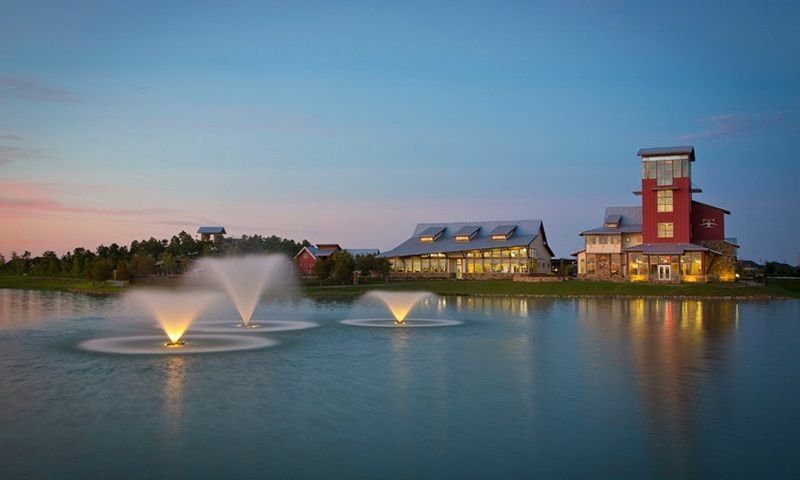 Homeowners also have access to the Cross Creek Ranch master-planned community's clubhouse. The clubhouse features a sprawling fitness center with locker rooms as well as a cafe and community room for neighborhood-wide events. There is also a pool, patio, as well as basketball, volleyball, and tennis courts. Other outdoor amenities include a dog park, picnic area, and a disc golf course. Golfers will also delight in having the Weston Lakes Country Club nearby, which has an 18-hole, par-72 course. Designed by Hale Irwin, this beautiful course is accessible yet challenging, giving golfers an incredible game regardless of experience. There is also an additional clubhouse with a fitness center, a golf pro shop, and the Waterside Grill for enjoying a meal and drinks after a round with friends. Taylor Morrison began construction of this 55+ neighborhood in 2016 and plans to offer 700 single-family homes upon completion. Active adult homebuyers can choose from a great selection of unique home styles that come in three design collections, which include Landmark Series, Summit Series, and Pinnacle Series. The single-family homes within the Landmark series range in size from 1,582 to 1,910 square feet and offer moderately sized two bedrooms, two bathrooms, and an attached two-car garage. The Summit Series is a terrific option for active adults who want a bit more space. These homes range in size from 1,933 to 2,234 square feet and offer two or three bedrooms, two or three bathrooms, and an attached two-car garage. The Pinnacle Series includes homes ranging in size from 2,374 to 2,878 square feet. They have two or three bedrooms, two-and-a-half or three bathrooms, and an attached two or two-and-a-half-car garage. With open floor plans and single-level living, these homes are perfect for today's 55+ homebuyer. Residents can also relish in the covered rear patios, spacious master suites, gourmet kitchens, and walk-in closets. Some homes also offer dens, living room fireplaces, and outdoor kitchens. This active adult community will provide a welcoming and vibrant atmosphere where neighbors can mingle, relax, and have fun. There will be activities and events like cards, games, billiards, arts and crafts, social events, and holiday parties. Residents can stay active by joining a pickup game of basketball or start a new tennis, pickleball, or volleyball team. They can also learn a new hobby or share similar interests with other like-minded adults. With endless options for socialization and recreation, homeowners will never have a dull moment in this beautiful and friendly community. As more residents move into the neighborhood, more events, clubs, classes, and activities will be added to the social calendar. Living in Bonterra at Cross Creek Ranch means enjoying proximity to Houston while having a quiet, close-knit community to call home. Katy Mills Mall is nearby for all your shopping needs, while the surrounding area also offers plenty of dining and entertainment options as well as outdoor recreation and attractions like Brazos Bend State Park, George Observatory, farmers markets, Fort Bend County Museum, and Fort Bend Theater. Interstate 10 is just 15 minutes from the development and, for farther travel, George Bush Intercontinental Airport is less than an hour away. Bonterra at Cross Creek Ranch is an exciting 55+ community in Fort Bend County, Texas. Bonterra at Cross Creek Ranch will offer homeowners a well-equipped clubhouse for the exclusive use of 55+ residents. In addition to the planned clubhouse, residents in the Bonterra section will also enjoy access to the amenities found within the Cross Creek Ranch master-planned community. Near the Cross Creek Ranch community is the Weston Lakes Country Club, featuring an 18-hole golf course. Homeowners within the community enjoy a waived initiation fee as well as six months of unlimited cart rentals. There are plenty of activities available in Bonterra at Cross Creek Ranch. Here is a sample of some of the clubs, activities and classes offered here. The Landmark Series will feature homes that range in size from 1,582 to 1,910 square feet. These homes will be modestly sized with two bedrooms, two bathrooms, and an attached two-car garage. The Summit Series is a terrific option for active adults who want a bit more space. These homes range in size from 1,966 to 2,234 square feet and offer two or three bedrooms, two or three bathrooms, and an attached two-car garage. The Pinnacle Series is Bonterra at Cross Creek Ranch's largest, with 2,374 to 2,878 square feet. These homes have two or three bedrooms, two-and-a-half or three bathrooms, and an attached two or two-and-a-half-car garage. 55places.com is not affiliated with the developer(s) or homeowners association of Bonterra at Cross Creek Ranch. The information you submit is distributed to a 55places.com Partner Agent, who is a licensed real estate agent. The information regarding Bonterra at Cross Creek Ranch has not been verified or approved by the developer or homeowners association. Please verify all information prior to purchasing. 55places.com is not responsible for any errors regarding the information displayed on this website.